This morning Mtn Rat and I decided that we deserved a day to sleep in after two strenuous days in a row. We agreed not to start hiking til 7am. 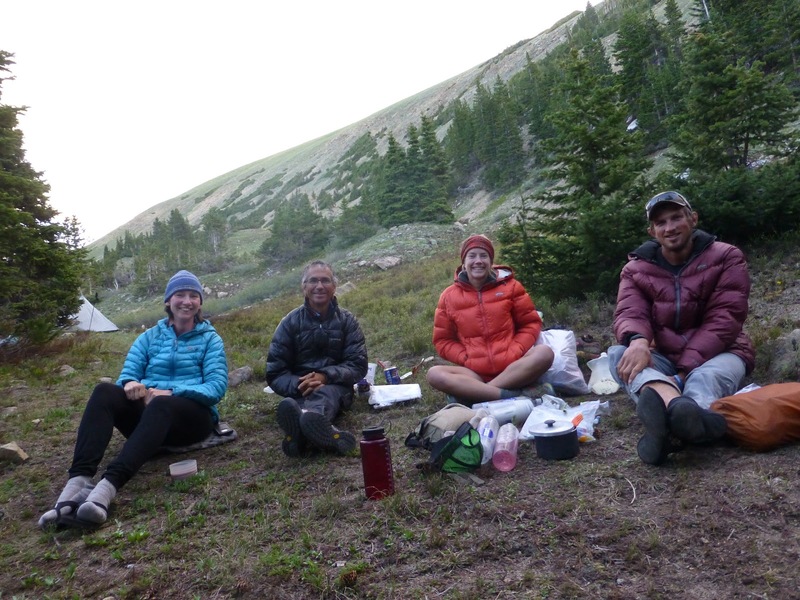 What we didn’t realize is that well before that, we would hear the voices of the many people as they were hiking up in the predawn hours on their way to summit Grays. I first heard people at 4am and then at 4:30am a dog ran over to our tents, which were about 50yds off trail, and growled next to my tent as the owner yelled for him. We aren’t used to being on a trail used by so much of the public and totally didn’t think about this as a factor for this morning. Once I was awake, of course I had to get up to empty my bladder and then I ended up journaling on my phone for a bit until I got tired enough to fall asleep again. I was in and out of sleep and we hadn’t set an alarm since we knew we would naturally wake up by six…or so we thought. We both had fallen back asleep and next thing I knew, I was awoken by the bright shining sun quickly warming my tent. This never happens to most thru hikers as we are usually up and hiking before the sun can get that high. I yelled over to Mtn Rat for the time since my phone was off to save what little battery I had left. It was 6:38am! That’s really late for us, so we must have really needed the sleep. The problem was that last night on top of Grays, I called two people and told them I’d be meeting them at a trailhead 8mi away at 10:30am. One was Scott, who I stayed with in Breckenridge. 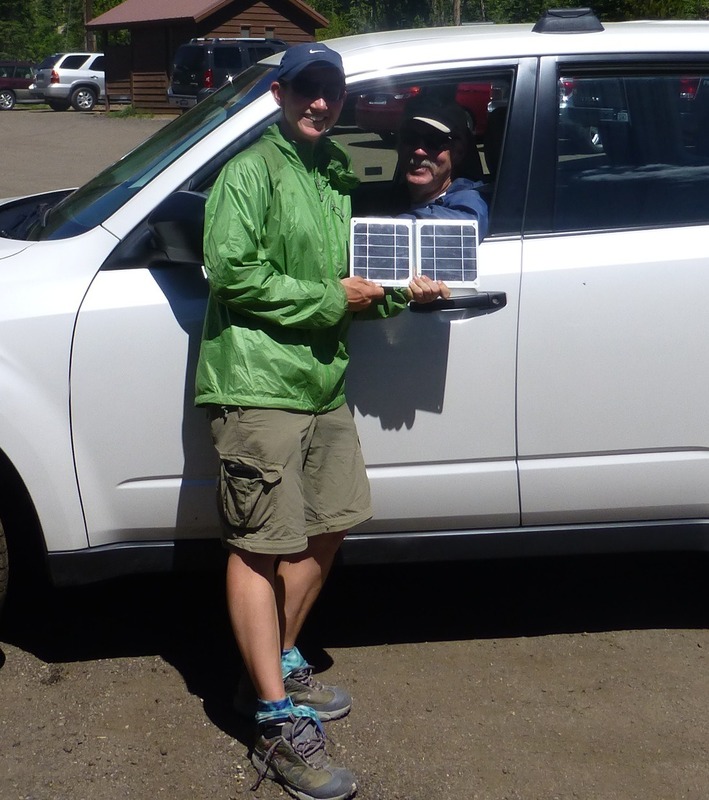 I had left my solar charger at his house and he was kind enough to drive out return it to me at the trailhead off I-70. The other person is a fellow PCT 2011 hiker who wanted to meet me at that trailhead to do some trail magic. Mtn Rat and I were able to get ready in less than 30mins(I tend to take 45mins-1hr) with the warm sun on us. It was amazing as I usually do as much as possible while in my sleeping bag until the last minute right before I get out of the tent. It was going to be a warm day! We sped on down the trail and were going against traffic with still many more people on their way up to summit. It was cool to look back and see thr mountains with the faint moon still between them. 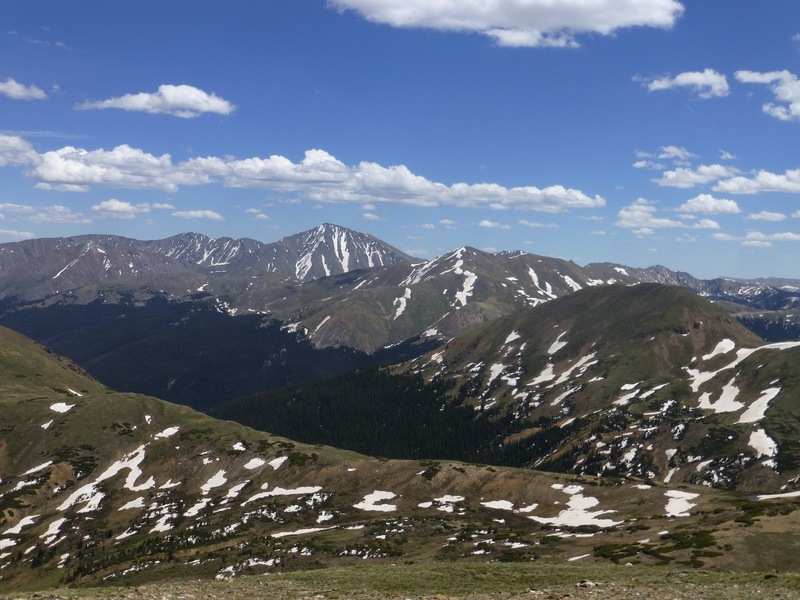 Grays is on the left and Torreys is on the right. We had to refrain from conversation in the way down as we were in a hurry, but we did stop and talk to a few people who inquired as to how we were already hiking down when everyone else was just beginning and going the opposite direction from the trailhead. When we hit the trailhead, we had two miles on a dirt road and then 4mi parallel to I-70 on a nice paved bike path. That’s a first! We cruised and made it to our destination at the trailhead 20mins early. Bert(as in Bert & Ernie from PCT 2011) and his girlfriend, Megan were already there and had a table set up with a grill for burgers and tons of drinks and snacks! Such a great luxury after these last two days! We hung out with them for 1.5hrs and ate all we could! This was Mtn Rat’s first real trail magic from people along the trail other than a cooler and he absolutely loved it too! The best part was that Bert and Megan had Gatorade in the cooler and I got to replace my lost Gatorade bottle! This was a great practice run for them because tonight they are going to catch the rest of the crew where they camp and they will give them trail magic for dinner. Bert and Ernie hope to do the CDT next year so keep an eye out for them and their blog. While we were there, Scott came and brought me my solar charger and then all was right with the world again. THANK YOU Bert, Megan, and Scott! All great trail angels!!! After our big break, we were ready to power up Herman Gulch which had a couple thousand feet of elevation gain. Again, we were against traffic and many people were hiking down from their morning hike. It was really great to see so many people that active on a weekday! It must be a really popular day hike. We noticed that few seemed to I is that they were also on the CDT. We talked to a few couples and really enjoyed our conversations with them before our trail split off to head back up to 12,000ft and on top of the Divide. We real loved the trail the rest of the day as we were in more gradual trail along the Divide and the views were just spectacular! 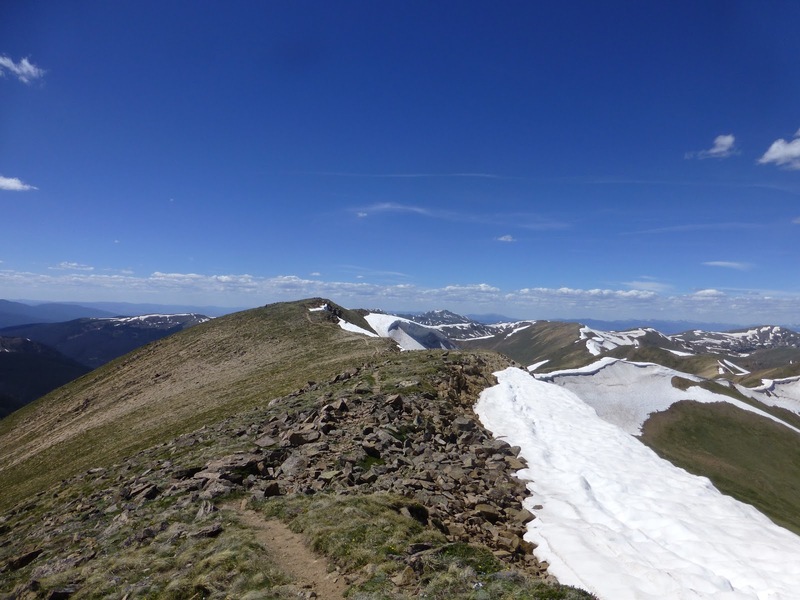 It is just pretty unbelievable when we are hiking of the actual Divide for and extended period of time. Looking back, we could see Torreys towering higher than the mountains around it and it was cool to see how far we had come in a day. 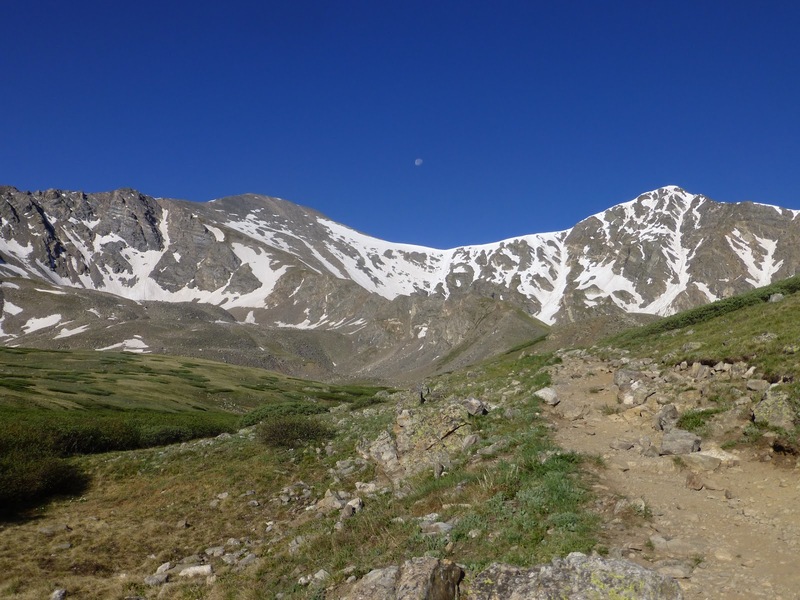 Later in the day, the CDT joined up with the alternate route that used to be the CDT that is known as the Silverthorne route. It is a route that is 50mi shorter and lower elevation that some hikers choose to take. We wondered who we might see as we noticed new footprints on the trail that seemed relatively recent. We planned to end the day at a specific water source that looked questionable to camp with the steepness, so we were prepared to hike on. As we rounded the corner, we saw a tent perched above the stream in a great spot and it was two hikers we had just been talking about! They are a couple named Track and Field who Mtn Rat overlapped with a bit already and who I met in Lordsburg the night before they started. 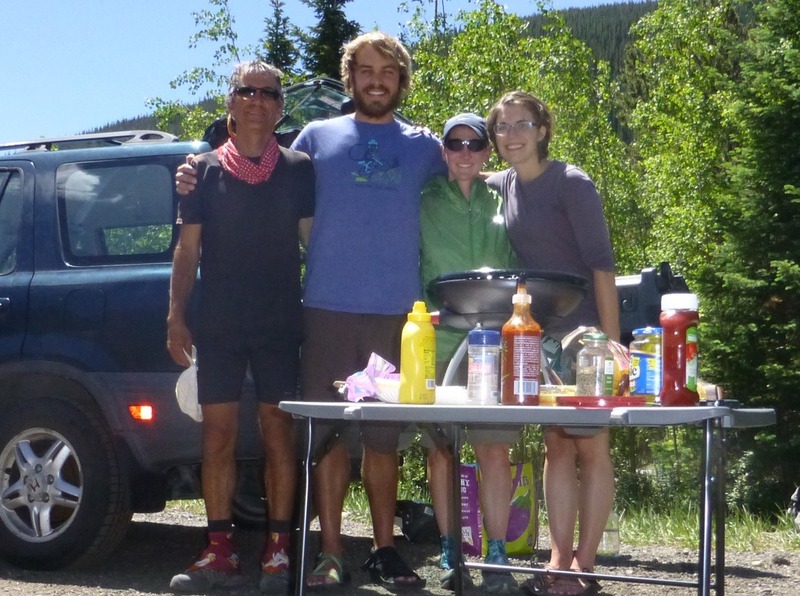 They had taken the Silverthorne route and it was great to get to camp with them. They both coach track at the same high school and are pretty athletic and speedy hikers, so that’s where their names come from. We are all on the same schedule into the next town of Grand Lake, so we may overlap the next few days. Tomorrow, Mtn Rat and I would like to do a bigger day and we are hoping for more trail like we had today!